Ellen’s Tuna Queen or called by some as ETQ for short, is nice, clean, and has a cozy ambiance. 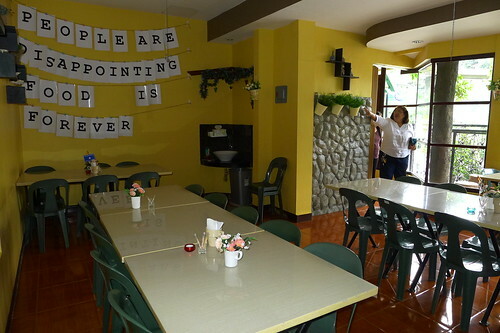 The resto used to be the garden area of Ellen’s home where ETQ is now located since 2011. We immediately felt at home and we like the place. It looked better than what I imagined the “carinderia” to be which is now turned into a small restaurant. 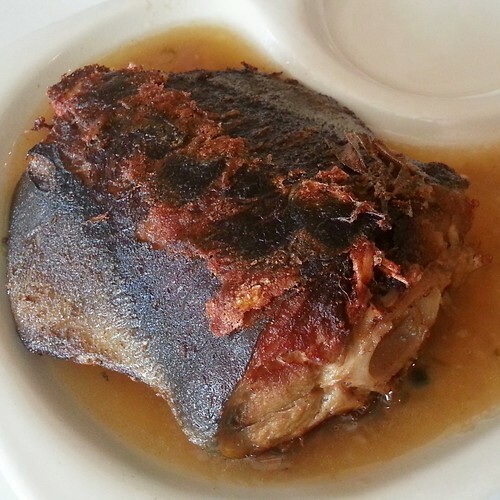 Ellen’s Tuna Queen, has been known as a must-try home-grown restaurant in Davao City famous for their specialty – their fried tuna tail paksiw or pritong paksiw na buntot ng bariles. 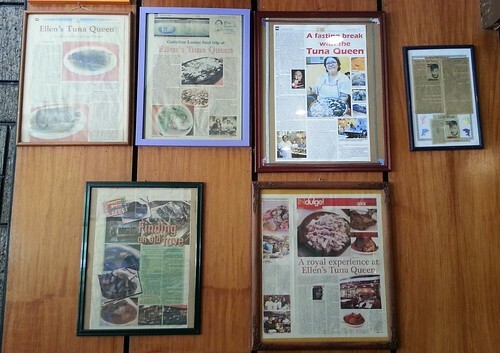 A visit to Ellen’s Tuna Queen should not be without their famous signature dish which they refer to as “the one that started their story”. By word-of-mouth, it was already popular way back in the early part of the decade 2000. I’ve heard often about it from my hubby and other people as the known carinderia located then at Petron Gas Station in Bajada or J.P. Laurel Avenue, Davao City (now currently the place of Jollibee Bajada branch) frequented then by many loyal customers for their original pritong paksiw na buntot ng tuna. Well I was amazed to connect them just recently as one and the same. Now from that popular carinderia, it has grown more popular and has been featured by the print media through the years as shown in the photo above, as well as different food and TV shows by known celebrities who love food as well like Chef Sandy Daza in his FoodPrints, a food travel series featuring Chef Sandy’s food adventures around the Philippines aired at Lifestyle Network channel. Ms. Ellen did show us the video of that particular feature which you can view at Vimeo. Hubby loves paksiw na buntot ng bariles or tuna. Long time ago he has been wanting us to try this kind of dish in a few restaurants around the city serving them. I almost always have my cravings satisfied when we decide for a food trip but once in awhile I wanted to give in to my hubby’s fave dishes as well. That’s is why I have kept Ellen’s Tuna Queen in mind most of the time as a place we must visit. Sometime last year when we had a chat with someone we knew who owns a Davao home-grown coffee shop and loves to eat around in and out of town, she mentioned Ellen’s Tuna Queen to us. That is somehow how we got the name stuck to our mind. Since then through word of mouth too, we have heard often of Ellen’s and it’s famous paksiw na buntot ng tuna or bariles often. Finally we got a chance to visit ETQ for lunch today on our day off with my boys. We got to taste their signature dish of course! This is indeed a must try at Ellen’s Tuna Queen. This pritong paksiw is perfect to eat these days of Lent too especially for those abstaining from pork this season, for health or personal reasons too. Paksiw is food cooked and simmered in vinegar. My parents would love this if ever they get to dine here next time. Surprisingly my picky little guy who is really choosy with the taste of food that he eats, he liked the pritong paksiw! One thing for sure, my boys enjoyed it well. Hubby who really loves paksiw was indeed happy and smiling we finally made it to ETQ. Now what I have in mind that I really wanted to try there was their laing which many customers described as the best they’ve tried. I’ve been craving for laing for quite sometime and this is an answered prayer. More than that actually. Their laing really tasted good and delicious for me! I have acquired the love for laing since I first dared to taste it at the local restos we visited during the Sooo Pinoy food trip Davao leg almost three years ago. Since then I would try to taste every laing served in the city. Ellen’s laing is one of the best I’ve tasted. I like their version too. I could really taste the gabi leaves and the delicious taste is unique and stands out from the rest of those we’ve tried before. While I have come to see that indeed they have a small serving of this delicious dish, honestly I realized then that we don’t need to have a big serving of this to enjoy it. This serving is often described as small but I think it is enough. It was even more than enough for the two of us sharing one serving. But if you want to indulge in so much more and you are really hungry for a lot of this, you can always have another order of it and perhaps you may even end up to still bring some of it home. I’d like to try using this for my alternative dressing for our fave penne pasta salad. 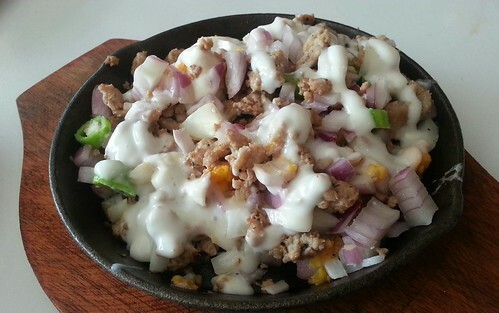 They also have their Tuna Sisig, one of the recommended dishes to try there. This is just one particular serving that happens to have a generous amount of mayo topping. I like mayo so this was a blessing for me. This is another fave among Ellen’s regular customers and a must try too. 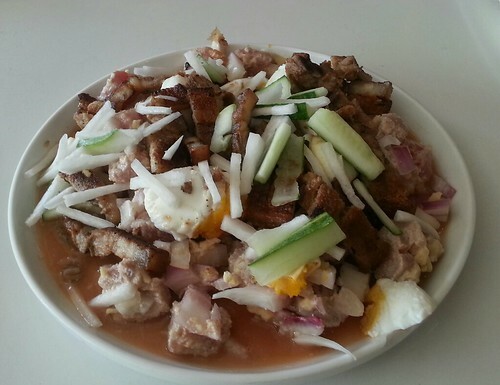 They also have another favorite Filipino dish the sinuglaw with salted duck egg. They make their own sukang tuba that they use in this dish. This is really yummy according to hubby! He likes sugba and kinilaw while I am have never been much into kinilaw ever since. I digged in a little this time to try it and it was good! Now they have this new dish paksiw na barilison sa gata, another delicious dish for me. I like this and it’s delicious especially for those who love fish and dishes with gata. This is a must try. 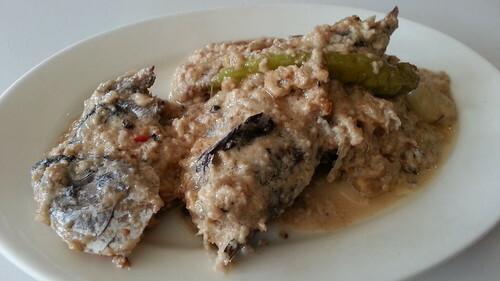 I was also able to have a bit of a taste of their Bicol Express, a popular Filipino dish. Their version is a delicious mix of tuna and shrimps. For those with what they call ‘meaty appetite’ they have the Adobong Puti which is another variety of the fave Filipino adobo that uses vinegar and patis, instead of the usual soy sauce. 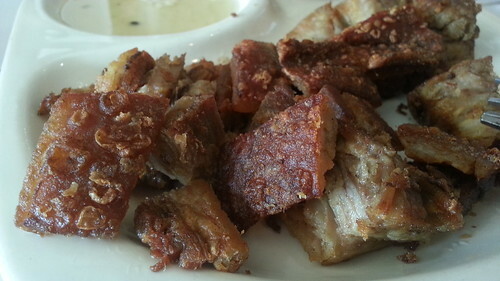 Then they have their crispy lechon kawali, also another fave among people I’ve known who have dined at ETQ. 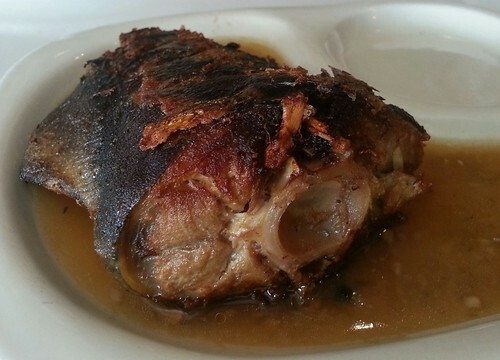 They also serve other Filipino dishes like kare-kare, pochero, kaldereta, sinigang na tuna, pork liempo and humba na pata. Their grilled steak is also a best-seller. We enjoyed these dishes shown above while chatting away on a nice Friday afternoon. 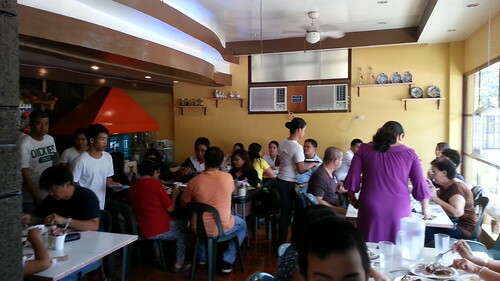 The resto was never empty even after the busy lunch hour today. Then it was time for dessert. Now since we can really feel the heat of summer already these days, you may want to indulge in halo halo. 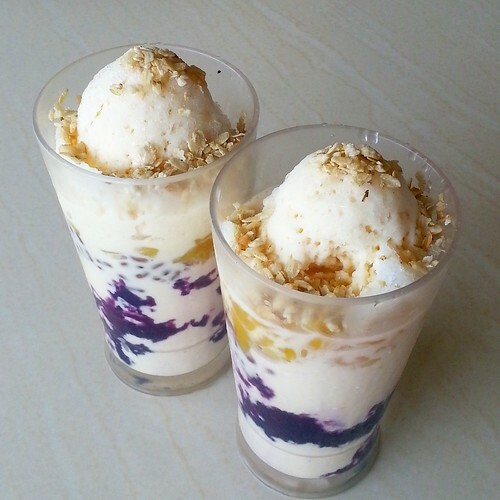 Their version of halo-halo can be a nice choice of a sweet and cold treat to beat the heat this summer. They have big servings of halo halo compared to others. It can be good for sharing too and it is always good to share it with a friend or loved one. One could enjoy their big serving of halo-halo in any given hot summer afternoon while having a nice view of the outdoors. 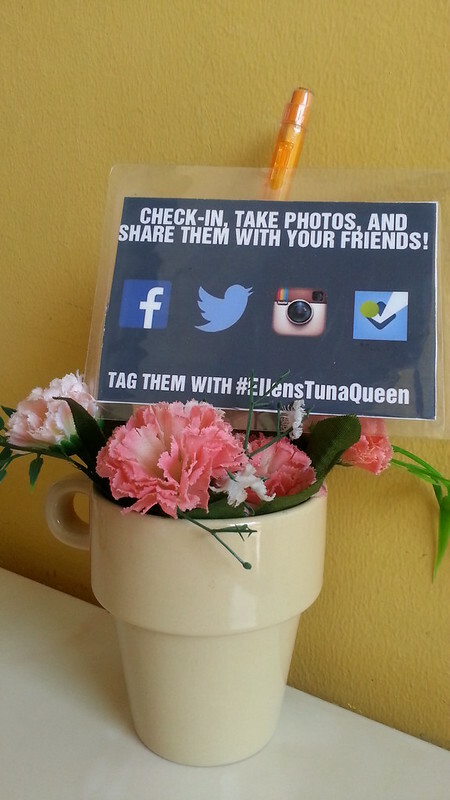 Ellen’s Tuna Queen is open Monday to Saturday from 7:30AM to 9:00PM. 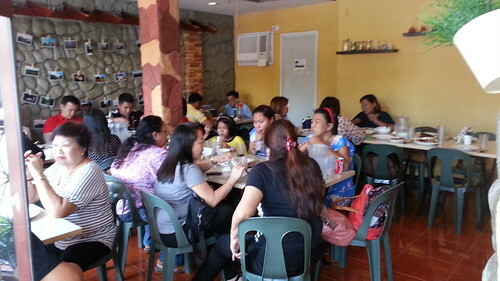 The place is usually really full for lunch at 12:00 noon to 1:00PM. If you want a more quiet time to enjoy your food and stay chatting with family and friends, you may come around 1:30PM – 6:00PM when it offers a more relaxed atmosphere. 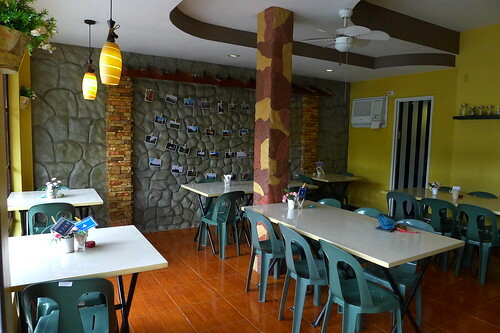 This is their extension that was opened to cater to more diners with their ever growing number of regular customers. 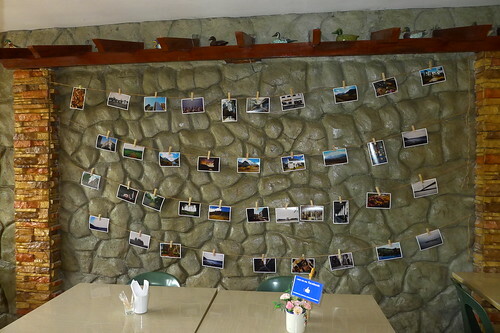 The photos that you will see on the wall were taken by Maam Ellen’s only son, John from his travels abroad. 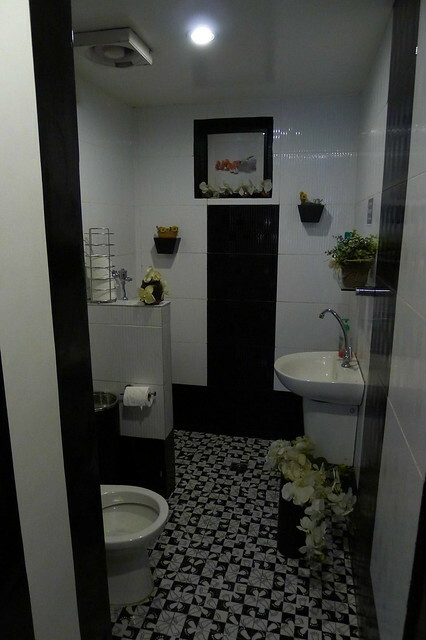 We were also shown their comfort room located at the back of restaurant’s extension. 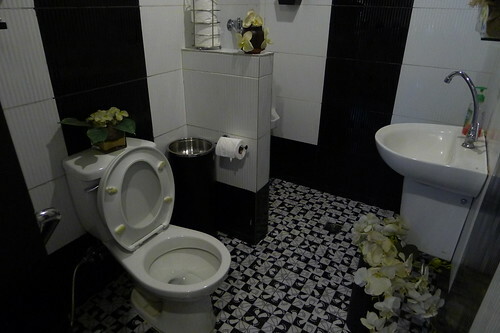 It somewhat feels like stepping into a nice and clean hotel’s comfort room. 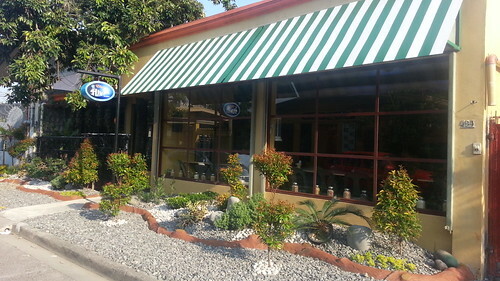 When in Davao, visit and dine at the Ellen’s Tuna Queen which is located at #494 South Street, DBP Village, Ma-a, Davao City which is just walking distance at the back of S&R Membership Shopping in Matina near NCCC Mall. It isn’t hard to find. When you enter Ma-a Road just after S&R turn left when you see DBP Village. You won’t miss it since there is a signage at the village entrance. Just a few meters away from the village entrance at the left side you should not miss finding Ellen’s Tuna Queen. 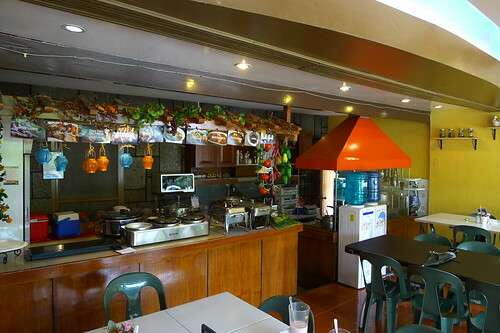 Since they opened ETQ in their house in DBP in March 2011, it has been a constant place to dine for many Davaoenos – foreign and local tourists, families, friends, doctors and other professionals. 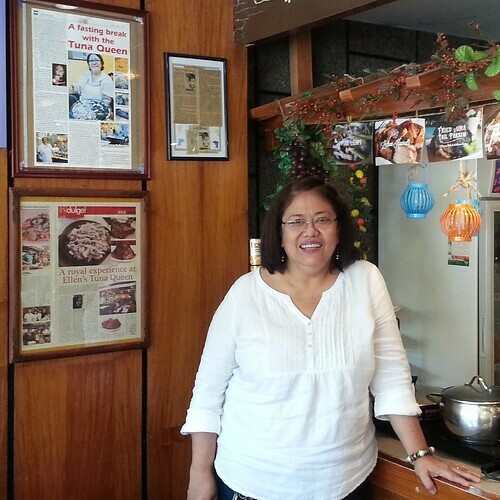 It had made a name for itself a long time ago and it continues to do so in Davao’s ever growing food scene. I am hoping more home-grown restos like Ellen’s Tuna Queen will sprout in subdivisions and villages around the city that provides delicious lutong-bahay that is affordable and reasonably priced given the quality and taste of food that they serve. We may have been quite late in making this long overdue visit to Ellen’s Tuna Queen. There is always a first time. I am grateful for the circumstances that made this possible and we are truly grateful to Maam Mina and her sister, Elena “Ellen” Ingan-eng Allanegui, the Tuna Queen of Davao. Talking to Ms. Ellen who I consider an established name in Davao’s food business, has made it a wonderful Friday afternoon of learning experience for us. 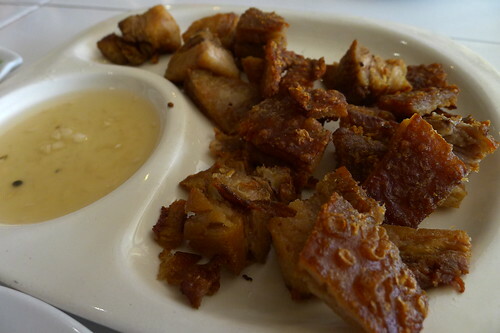 This is a food trip in Davao that we will remember! Thank you Ellen’s Tuna Queen! Till our next food trip! 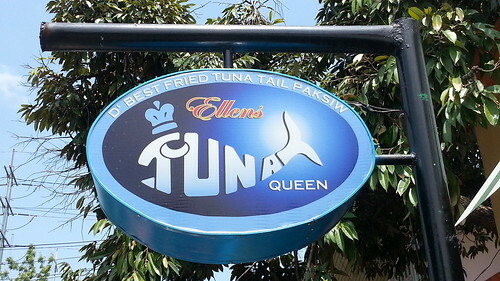 Ellen’s Tuna Queen is a must dine place in Davao talaga. Wow!! Pritong paksiw na tuna the best jud. 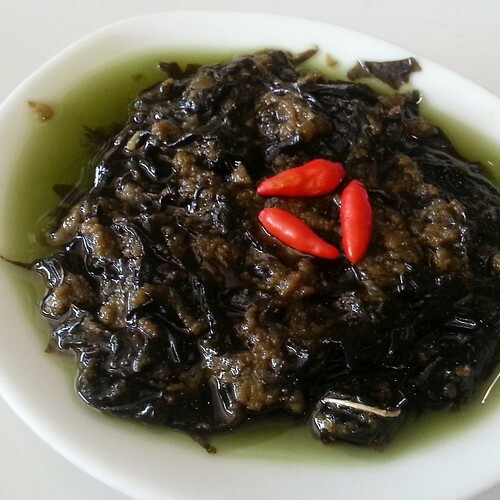 Fave ko ang laing nila… sarap! Makagutom magtanaw sa pics… suroyan namo ning Ellens. *** MASARAP TALAGA DITO SA ETQ! THE BEST! Anybody visiting Davao should really try this! Superb food!